Top Tables 2019 is officially out! On Mar 27 at House No. 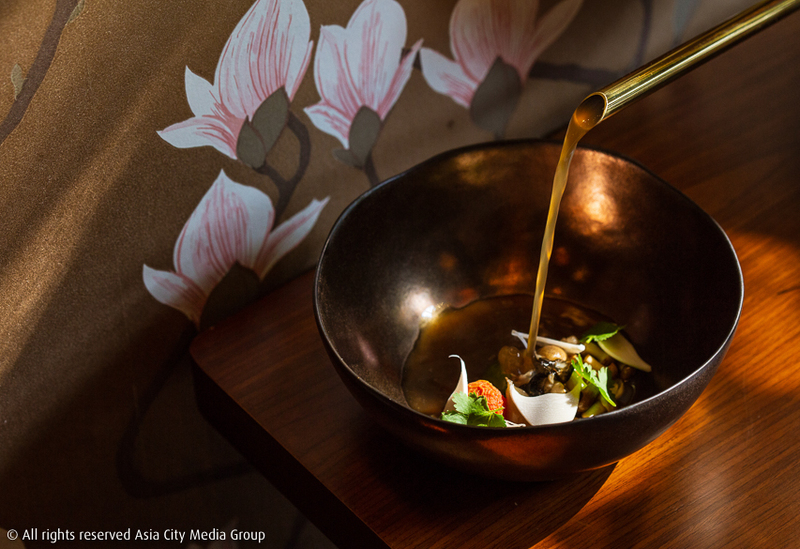 1, we announced Bangkok’s 100 best restaurants during our annual Top Tables Awards night . A crowd of over 400 chefs, restaurateurs, food industry professionals and media partners gathered at the Charoenkrung Road address to hear the announcement. Winning the top spot for the third consecutive year was German fine dining restaurant Sühring. Twin chefs Thomas and Mathias Sühring have redefined their nation’s cuisine with meticulously presented German tasting menus that are now recognized around the globe. In second position comes Gaa, the unconventional and inventive new-Asian restaurant of chef Garima Arora, followed by her neighbor and former boss Gaggan (headed by legendary chef Gaggan Anand) at no. 3. This year’s Top Tables Top 10 also had a Thai flavor, with Bo.lan (no. 5), Paste (no. 7), Le Du (no. 9) and Sorn (no. 10) all collecting top honors. 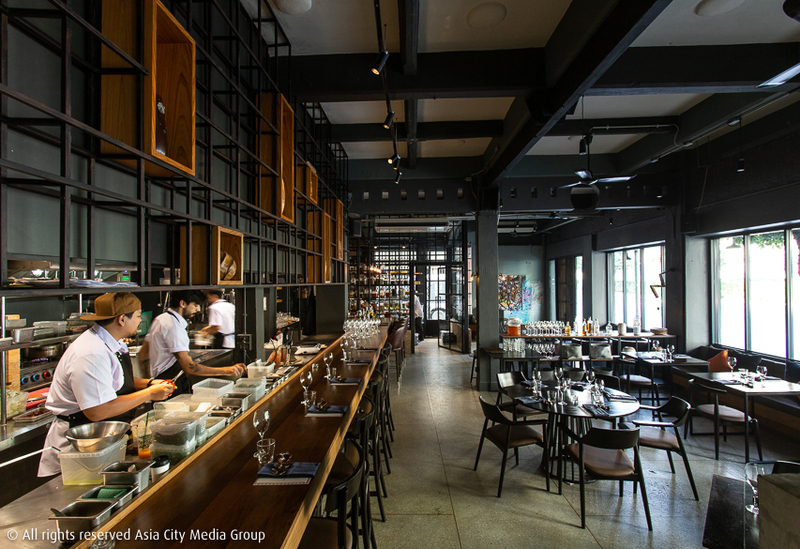 Bo.lan also collected 2019’s Best Thai Fine Dining Award for its uncompromising approach to authentic and ethical culinary practices, while the Best Debut Restaurant Award went to southern Thai cuisine specialist Sorn. 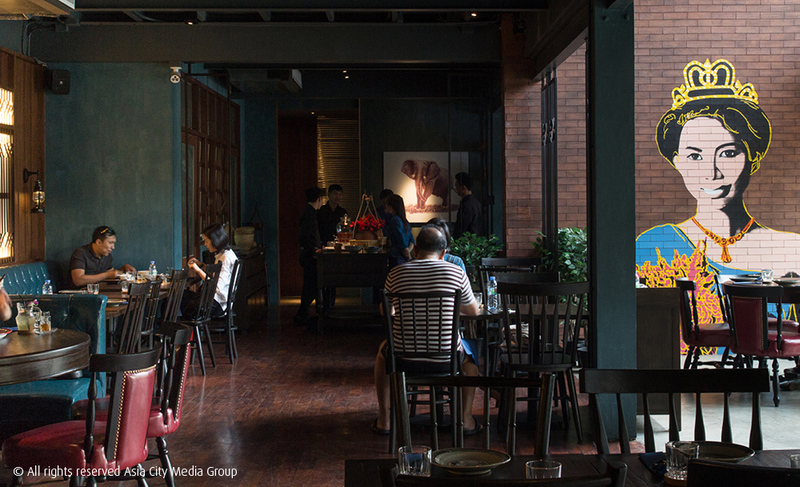 Now in its 12th edition, Top Tables remains Bangkok’s most trusted local guide to fine dining. Each restaurant in the guide is selected by a panel of 30 foodies, bloggers, journalists and F&B professionals free from affiliation with restaurants in the guide. Each panelist must vote on 200 restaurants, and only the highest-ranked 100 places make the Official Selection. The Top Tables 2019 guide comes free with the Mar 29 issue of BK Magazine. For your nearest distribution point, visit bkmagazine.com/distribution. You can also get your free copy of Top Tables 2019 online at bit.ly/2HDanr6 (PDF download) or visit bktoptables.com for all the latest Top Tables news. Don’t agree with which restaurants made the guide? Write to us at food@asia-city.co.th. We’d love to hear from you. The buzz: German twins Thomas and Mathias Sühring redefined the fine-dining landscape with their meticulously presented German tasting menus served amid sophisticated yet inviting environs. The years since Suhring's 2017 debut have only seen it move from strength to strength. The food: While a la carte remains, most guests—and especially those wanting to experience Thomas and Mathias's cuisine on the chefs' own terms—opt for the "Sühring Erlebnis," a tasting menu of three "Chapters" and over 10 individual courses that play with traditional German comfort food. Whether it's a northern specialty of corned beef, beetroot and pickled herring, or a comic reinterpretation of the classic "currywurst" sausage, immaculate plating finesse and extraordinary produce explain why the brothers picked up two Michelin stars. The place: Strikingly homey yet also refined. The setting in a generously portioned mid-century home round the back of Yen Akat Road retains its residential charm (note the warm details like a framed rendition of the Sühring family farm hanging on the wall), but also adds a striking open kitchen where the brothers work to the constant flicker of open flames. It's in this back portion of the house that we suggest guests request their seats, though the glass-walled main dining room also has its plentiful charms. The place: A bright yellow facade leads to a network of colorful rooms sheathed behind statement windows. Reserve downstairs if you want to take in what's happening in the multicultural kitchen (which stands isolated behind a wall of glass), but the second floor with its aubergine leather banquettes and smooth Scandinavian dining chairs offers the more intimate experience. The buzz: Is Gaggan Anand Asia's most famous chef? With a Netflix Chef's Table special and a string of wins at Asia's 50 Best under his belt, there's no doubt. And for what? Tasting menus that chart around 25 courses of Indian, Japanese, Tibetan and Thai flavors skewed beyond all recognition into everything from Minion ice pops to lumps of coal. The food: Clear three hours of your schedule, come hungry and don't mind eating with your hands. In the tradition of Japanese omakase, Gaggan has mostly dispensed with the need for cutlery, instead designing his transcendent courses—momo dumplings bursting with pork curry, grape juice and garlic; reinvented Indian snacks like idli and murukku—into individually prepared bites. Theater has always been a part of Gaggan's cuisine, whether its cauliflower ice cream disguised as a stick of white asparagus or (an Instagram star almost as famous as Gaggan himself) "Lick it Up," which arrives to the tune of Kiss and requires guests to literally lick strips of mushroom, pea and shaved truffles off their plate. The place: Despite the fame, Anand remains a regular master of ceremonies around his 13-seat chef's table (The Lab), displaying a truly inspiring level of energy and love for the task. His team of sommeliers, led by Vladimir Kojic (see page 80), show an equal verve for extolling the virtues of weird and wonderful labels to guests both in The Lab and out in the refined, colonial-style white-washed dining room. The buzz: The original home of Bangkok French fine dining (open for business since 1958) has soared back into every top-tier foodie conversation under chef Arnaud Dunand-Sauthier. Adding legitimacy to what Le Normandie diners already knew, his food won two Michelin stars, two years in a row. The food: Every great chef needs a dish that defines them. Dunand-Sauthier's signature: his Oscietra caviar with sea urchin and potato (see top left), an elegant soup of rich and salty seafood indulgence. Other courses are equally as subtle, graceful and driven by the best produce at hand. Choose between a tasting menu or concise a la carte of contemporary but unabashedly French courses. Whatever way you go, flawless consistency is guaranteed—as is demanded by the clientele of high-rolling Le Normandie regulars. The place: No local restaurant does old-school glamour as well as Le Normandie. The billowing gold fabrics, the gold upholstered chairs, the gold carpet, the chandeliers—we’d call it tacky if it didn’t feel so special. Crepes suzette gets flambeed tableside and a maitre’d regales you the minutiae of every course in a hushed and precise whisper. When's the last time you ate somewhere that jackets were "compulsory for gentlemen"? The buzz: With a new breed of Thai restaurant preaching hyper-regional cuisine and pledging allegiance to all things sustainable, Bo.lan’s reputation as a fine-dining trailblazer only continues to grow. For a decade now, Duangporn Songvisava and Dylan Jones (aka “Bo” and “Lan”) have challenged diners to question their definition of Thai cuisine. Beyond rare ingredients and reborn recipes, the chefs are also tireless in their pursuit of a zero-carbon footprint. A rogue, anti-establishment attitude only adds credibility to their efforts. The food: Diners sign up for a degustation menu where all the dishes are served simultaneously in a sharing experience akin to a Thai home-cooked meal, albeit with refined presentation. Bo.lan’s menu changes quarterly based on the seasonal produce sourced both from independent farmers and the veggie patch on-site. You’re rewarded with richly spiced curries, complex salads and fiery stir-fries that could only be the result of untold hours of research and labor-intensive techniques. The place: Taking inspiration from classic Thai residences, the interior of this renovated house comes replete with warm wood furnishings, while dark, multi-dimensional oil paintings of old-school Thai kitchens and covers of vintage Thai funk records lend a cool edge. The complete absence of an a la carte menu ensures long, memorable meals. The buzz: The passing of Joël Robuchon in 2018 drew an outpouring of grief from all over the restaurant world. At the Bangkok outpost, head chef Olivier Limousin continues to treat us to the maestro’s exceptionally high and consistent standards for French cooking (and, yes, that mashed potato), while simultaneously leaving his own indelible mark. Not many places in town do fine dining quite like here. The food: Luxurious ingredients star in Gallic food that's refined without losing its heart. That might mean steak tartare coated in Perigord black truffle shavings on a bed of baby mache leaves; Sologne Imperial caviar in a lobster jelly; or a Challans duck breast and foie gras duo served with Robuchon’s super-silky, buttery mashed potatoes. We’d tell you to save room for “your own preference from the dessert trolley,” yet that’s very hard when confronted with little L‘Atelier touches like the bread basket brimming with yeasty temptations. The vibe: Maitre d’ Gianvitto Zizzi’s lengthy tenure ensures repeat customers are given the welcome they expect at this level, as they take their stools at the glamorous, French interpretation of a sushi-style counter. The ultra high-end vibe begins on entrance as you’re greeted by a bucking Thawan Duchanee ink drawing, but once seated things are surprisingly social and informal. For those who prefer privacy, there’s more conventional table seating, too, and even a small terrace. The buzz: It feels like yesterday that chef Thitid “Ton” Tassanakajohn burst onto the scene with his contemporary reinterpretations of Thai classics and expert wine pairings. Five years have brought with them follow-up restaurants (see Baan, page 34), high-profile Top Chef Thailand appearances, Michelin acclaim and umpteen business-class flights, but have done nothing to dull chef Ton’s creativity and eye for meticulous detail. 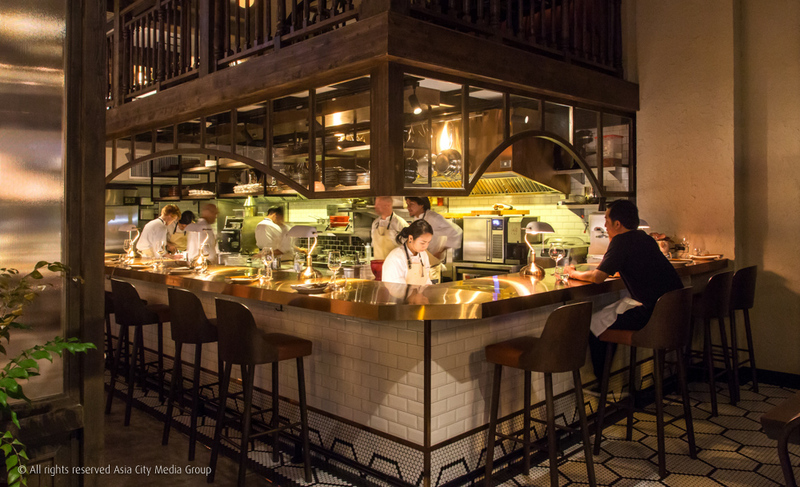 The food: Across four- or six-course tasting menus, diners are served artful dishes that defy the humble origins of pad kaprao, choo chee curry or larb. The transformations come courtesy of Ton’s highwire techniques, but the foundations are set by cream-of-the-crop local produce: squid from Satun province, mountain rice from Pai, ant larvae from the northeast. Desserts like a coconut panna cotta are almost too exquisite to eat. Topping it all off, Ton is also a certified sommelier with a taste for organic and boutique outfits. The place: All clean lines and white surfaces, Le Du’s original dining room shirks decor trends and lets you focus on your plate, where the sights, smells and flavors form true masterpieces. The second floor, with its bricks and dark lattice-work, allows for a moodier tete-a-tete. The place: The sleek interiors reference Thailand’s southern rainforests, with arched-metal works reflective of slender palm blades adorning the windows, and wood accents, earthy tones and lush green plants permeating throughout the various art deco-style dining rooms. The house itself is as old as 90 years and retains much of its original structure. 2019 saw Charoenkrung’s hipster hangout go upscale: kitchen bar seats, tasting menu, wine pairing and craft cocktails. Fermentation remains at the heart of chef Napol Jantraget’s nine-course menu, whether it’s a sinfully crisp slice of pork belly topped with infused mushroom and served with a fermented chili sauce or a tangy coconut cream with smoked goby fish. Desserts by Japanese pastry chef Saki Hoshino forgo sweetness in favor of sublimely challenging new flavors. Bangkok’s omakase scene has gone from zero to 100 in just a couple of years, and while many of these hallowed dens of raw fish can seem daunting, that’s not the case here. Japan-native Masato Shimizu earned his stripes in New York, and it shows in his warm, conversational demeanor where he’ll happily break out a book mid-meal to educate you on the relative merits of murazaki or bafun uni, or to explain at length his process of charcoal grilling (replacing the blowtorch). You won’t want your 20 courses to end. Chef Riley Sanders manages to do locally sourced and seasonally focused without throwing away the frills and sophistication of fine dining. Everything from the truffle to the cheese to the wagyu beef to the honey comes from Thailand. Sanders’ six-to-nine course tasting menus (no a la carte) are best enjoyed around the glistening kitchen bar along with the wine pairing. All this doesn’t come cheap, but there are few new restaurants in town that quite match the polished sense of occasion at Canvas—nor the seriously bold and inventive flavors on the plate. Nestled deep down a residential Charoenkrung soi, far removed from the Japanese hotbed that is Sukhumvit, this sleek izakaya is providing the fuel for many a big night out. To go with the plentiful sake, shochu and umeshu, chef Chet Adkins deals in Japanese-style grilled skewers that showcase both excellent produce and expert preparation. It’s transition time for Bunker. As long-time head chef, Filipino-American Arnie Marcella moves on, so does the restaurant. Tim Butler of Eat Me (Top Tables no.8) has designed the new menu of grilled shareables in league with on-site chef Lorin Janita and Nithit “Lenk“ Nithikampol. Enjoy the dishes with small-produced biodynamic wines. Gaggan Anand, four-time winner of Asia’s 50 Best Restaurants, partners with Takeshi Fukushima (of La Maison de la Nature Goh in Fukuoka, Japan) to open a fine-dining restaurant dedicated to tofu from Kyushu. The entire experience plays out over 12 courses served around the kitchen counter, kicking off with a shot of tofu milk and a three-tier bento box (creamy yuki tofu, sesame-infused goma tofu and a millefeuille of yuba, or tofu skin) before dishes like ultra-tender Kobe beef rib-eye served suki style and fillets of sticky-sweet kinki fish topped with a tofu emulsion. 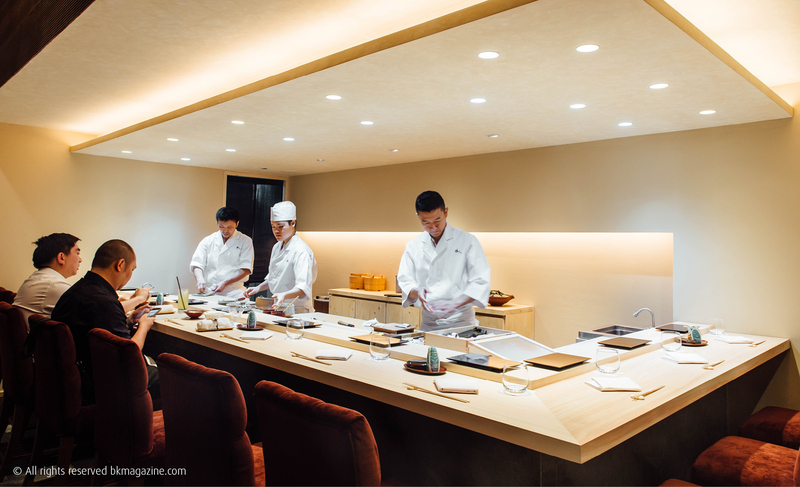 Now with its own Michelin star to complement the one at its Tokyo mother branch, Sushi Ichi treats guests to uncompromisingly authentic omakase-style sushi. Artistic, delicious, refined and subtle, the food (flown in daily from Toyosu Market) competes for attention with the very theater of omakase, where chefs in traditional outfits wield elegant knives and scrape fresh wasabi on boards strewn with shagreen. This deli-slash-bistro may represent the antithesis of Bangkok’s current locally-sourced ingredients obsession, but the foodies who swarm its open courtyard don’t mind. They come not only for the imported cheese and cold cuts (is there a better selection in town? ), but for the well-executed Mediterranean dishes that do justice to their seasonal ingredients. Order from the big chalkboards, where a frequently changing list of specials showcase the best of what’s fresh in. Bangkok’s go-to for a true taste of America’s Deep South is packed out night after night with barbecue lovers getting stuck into the smoky, sticky, fall-off-the-bone baby-back pork ribs. All the meat’s prepared low ‘n’ slow in the courtyard’s giant smokers, resulting in tender perfection and intense flavor made to be paired with a whiskey sour or three. A move to larger, Langsuan premises has done nothing to distill the raucous and friendly vibe. A new era beckons W hotel’s grand old colonial house. Chef Fatih Tutak has returned to his native Turkey, so naturally the restaurant is letting go of his Turkish-inspired tasting menus at the same time. As Bangkok diners await the announcement of who’ll take over The Dining Room, its ornate-yet-contemporary surroundings remain open to enjoy traditional Thai dishes and other comfort food classics drawn from the adjoining Courtyard menu. While you’ll still find some of Europe’s most-prized beef cuts dry-aging in the showpiece chiller, Il Fumo has moved from upmarket steak-house to purveyor of fine-dining tasting menus. Chef-partner Nelson Amorim brings the food culture of his native Portugal while cooking on open flames using house-made charcoal.